Convolvulus arvensis is along lived deep rooted weed belongs to the family Convolvulaceae. It is commonly known as European bindweed, bind weed, creeping jenny,morning glory and devil's guts. The plants contains Saponins, Alkaloids and Polyphenolic compounds Flavenoids and Tannins. It has stimulent, anti-oxidant,anticancer and laxative effect. This review shows its identification, some of the isolated compounds and its biological activities. Moreover it used as a therapeutic agent for a variety of diseases. The plant extract shown effective action on intial growth of Abidar barley. Moreover so many research proved its etheno medicinal uses in experimental animals. Its chemotherapeutic value has not been fully substantiated and the mode of action of its bio active compounds against diseases has no yet been established. 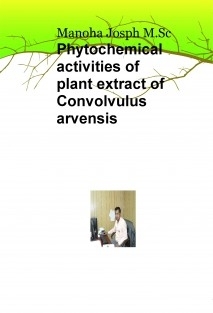 Hence the cultivation & collection for pharmacological exploration of C. arvensis are essential.